Teens shared their stories with other students during a Know the Truth presentation at Augsburg Fairview Academy. Left to right: Anthony, Troy and Casey. We hope that if you are ever faced with a situation where drugs are involved that you remember our stories,” said Anthony. Two years ago, Anthony was 40 pounds lighter and had overdosed three times in one month. Anthony was one of three presenters who shared their stories with students at Augsburg Fairview Academy on March 13, 2019 as part of Know the Truth™, the substance-use prevention program of Minnesota Adult and Teen Challenge. 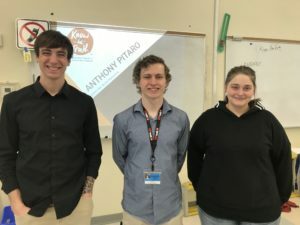 Using a peer-to-peer format, presenters close in age to the students share their personal stories and struggles with substance use, stripping away any glamour or myths and providing students with the facts. “We don’t tell you what to do; our experiences speak for themselves,” Anthony said. In many cases, the Know the Truth presentations are included in health classes, embedded into the drug and alcohol unit. Since 2006, the program has hosted more than 12,000 presentations and connected with more than 400,000 students. Last year alone, presenters spoke in more than 160 high schools and middle schools. With no question off-limits, the presenters, Troy, Casey, and Anthony, spoke genuinely about their experiences and highlighted resources for additional support, including reaching out to @knowthetruthmn on Twitter, and through the text hotline at 612-440-3967. Troy started drinking in middle school to disassociate from his homelife. By ninth grade, he was smoking marijuana every day, and that was the year that he failed his first class. Smoking eventually developed into using LSD, mushrooms, Xanax, DMT and MDMA. Then, when he tore his ACL in high school, he began using oxycodone that was prescribed to him for pain management. He overdosed twice. Similarly to Troy, Casey began using marijuana in middle school to cope with the death of two of her friends. By high school, she had turned to drinking alcohol and using other substances, including meth and heroin. “When I woke up in the hospital after my first overdose, my mom told me I had the choice to go into treatment, otherwise she couldn’t watch me do this to myself anymore,” said Casey. She chose heroin over treatment. “All that mattered at that point was making sure heroin was my top priority,” Casey explained. After her overdose, she spent almost two years moving between homeless shelters before she eventually came through the doors of Minnesota Adult and Teen Challenge where, for the first time in her life, she wanted to make a change. The Know the Truth Program has proven as life-changing for the presenters as it can be for the students. Presenters often view the program as a way to give back and help ensure that people can learn from their journeys. Students meanwhile, find the program to be an effective deterrent for substance use. The numbers speak for themselves. At the end of 2018, an outside research evaluator from the University of Minnesota validated the success of Know the Truth. This study showed that nearly one in four students who experienced the Know the Truth program reported an overall increase in healthy attitudes toward substance use and the risks associated with it, compared to only one in 12 who participated in only the standard health curriculum. Like Troy and Casey, the final straw for Anthony came at a young age when he was in jail again for trying to return a stolen vacuum. His mom told him she wouldn’t bail him out unless he went to treatment.